This tutorial presents how Beebotte can be used to build a Geolocation tracking application. In this tutorial we will create a Web Application that uses HTML5's Geolocation API to publish and track the location of a mobile phone (or compatible device). 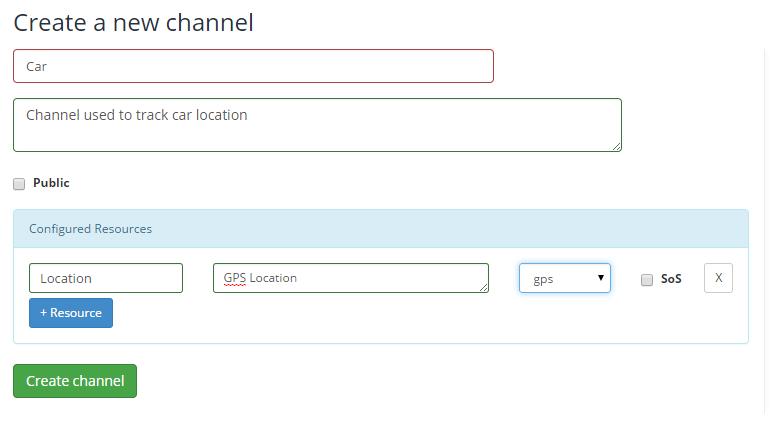 We will use Beebotte client API to publish the device location to a predefined channel resource. Then, we will subscribe to that channel resource to receive published location updates in real time and display them on a Google Map. We only need a device with a Geolocation capable browser. Geolocation is most accurate for devices with GPS as smartphones and tablets. For obvious privacy reasons, the device location is not available unless the user approves it. We will use Node.js for the application's backend. However, you can use an alternative technology of your choice. Porting the backend should not be an issue. app.js: This Node.js code creates a very basic Web Server. It implements the authentication endpoint that will grant your users access to Beebotte (required by the track.html and monitor.html web pages described below). public/monitor.html: This page will show the Google Maps with a marker that will get updated everytime the location changes. public/track.html: This page will simply activate/deactivate Geolocation tracking. When Geolocation is activated, the location of the device will be published to Beebotte on specific channel resource. You can fork the project from its Github repository. Initialize Beebotte by indicating the API Key associated with your account, and the Authentication Endpoint to grant your users access to publish data to Beebotte and to subscribe to channel resources. Remember, you are adding a realtime functionality to your application. Your users are not necessarily on beebotte. It is your responsibility to grant permissions to authenticated users. getCurrentPosition: gets the current position of the device. watchPosition: registers a handler that will be called automatically everytime the position changes. In this tutorial, we will use watchPosition to get position change updates. For one time position retrieval, you can use getCurrentPosition instead. This will send a private message on the given channel resource. In order to receive Geolocation messages published to your channel resource, you need to register to it first. As we only want to receive new location messages, we will only request read access. To subscribe to real-time data, you need to specify the channel and resource where the data is being published. In this example, we assume the data messages are private (that's why we added the private- prefix to the channel name). Subscribing to private channels requires explicit authorization. In order to display the received location on a map, we will use Google Maps API to create the map and to place a marker accordingly. The marker position needs to be updated whenever a new location is received. The authentication endpoint is a mechanism that needs to be implemented on your backend to grant your users read and write access to your Beebotte channel resources. The authentication endpoint signs your users subscribe requests. These signatures are then attached to subscriptions sent to Beebotte. For details about the client authentication in Beebotte, you can refer to the following link. So far we considered location messages as transient. This means location will be routed through Beebotte from publishers to subscribers without being saved in Beebotte. If you wish to save location data for future use (save where you parked your car, car trajects, etc. ), you need to create a channel for that puspose. Now instead of publishing location data to Beebotte, we will write location data to Beebotte. This allows to save data for future use. In this tutorial we saw how to use Beebotte to track the position of a device using Geolocation API and Google Maps API.